Manicurist to the stars Michelle Saunders demonstrates a lovely and simple twist on the French tip. Use Essie polish in Ballet Slippers, Fiesta, and Lollipop to get the look. Manicurist to the stars, Michelle Saunders, demonstrates a lovely and simple twist on the French tip. Use Essie polish in Ballet Slippers, Fiesta, and Lollipop to get the look. 1. Apply a coat of First Base base coat allowing each nail to dry. Layer two coats of Ballet Slippers on all 10 nails. 2. Apply a coat of Fiesta to the top half of the nail, closest to the tip in the shape of two circles. Make sure to wait two minutes for it to dry thoroughly. 3. With Lollipop, follow the same lines as Fiesta, leaving enough pink peeking through so it looks like double hearts. Finish with a coat of Good to Go top coat. 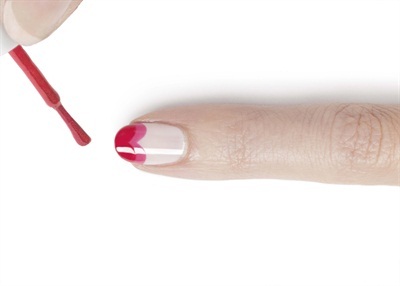 For more Valentine’s Day nail art tutorials, click here.